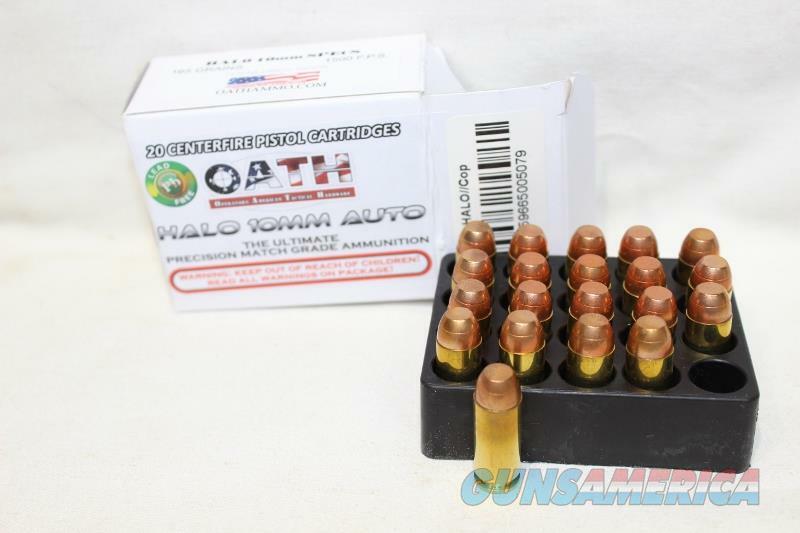 Description: NO LONGER MADE, Oath Corp Ammo, new in the box, 10mm halo, 165gr, 1500FPS, 20rds, this is the fmj version of the tango ammo, more than one box available, made in USA, get it while you can only a few boxes left, other caliber available, see listings, . Must be 21 years old to purchase, will have to sign for ammo during delivery. Credit cards add 3% to the total if purchase is over $100. We are a FFL, Florida residents add sales tax for your county, there is no local pick up and we do not have a retail store for you to come see the item. Price listed is a cash discount price. Credit cards add 3% to the total. This ammo will not ship to CA, MA, CT, MD, Washington DC, IL, NJ, CO, NY, or any other place it is not legal or where the state has complicated ammunition laws. You are responsible for knowing if the ammunition is legal for you to own. You must be 21 years old to purchase. You will have to sign for the ammo. It will ship via UPS. The shipping is what it will actually cost for one box. If you are getting more than one the shipping will need to be recalculated. There are no local pickups. You will need to provide your birthdate before shipping.